As much as it may seem otherwise, one of the only non-spoiler things that we can say about tonight's UK Doctor Who season finale is that it's the last time you'll see Sarah Jane Smith in the series. But don't take that as a hint to the character's fate; it has much more to do with actress Elizabeth Sladen's knowing when to say goodbye. This time, actually, I said to David [Tennant], 'I've never thought this before, but I think this is the last time I'll be here'. It felt like it was my last time on Doctor Who... I'm happy with that... You have to stop somewhere. And then I thought, well, I'd better enjoy these episodes. And I did. I had the most amazing time. It's been fun. 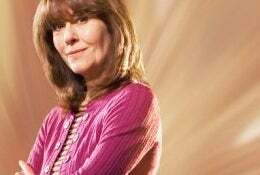 Don't expect that this means that departing showrunner Russell T Davies will get to go out with a bang that'll take care of Sarah Jane; Sladen is still slated to appear in the second and third seasons of her own spin-off series, The Sarah Jane Adventures.